Have you ever been presented a food, activity, or perhaps a new friend, about which you already had an opinion? Had my brother-in-law never provided a proper re-introduction to farm fresh asparagus, I would have missed out on some delicious dining experiences. Had my husband not invited me to learn to play tennis in my mid-thirties, I would have deprived myself of years of physical activity and cherished friendships. 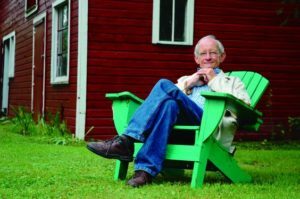 Had a gentleman, who I greatly respect and admire, never suggested reading “Delights & Shadows” (Ted Kooser), poetry would probably not have found such a meaningful place in my heart and on my bookshelf. Merriam-Webster defines poetry as, “Writing that formulates a concentrated imaginative awareness of experience in language chosen and arranged to create a specific emotional response through meaning, sound, and rhythm.” As a young adult, I read “The Raven” by Edgar Allen Poe and “The Road Less Traveled” by Robert Frost. Like many, my notion of poetry as a style of writing was limited to those works that followed traditional rhythm and rhyme and the meaning may have become muddled in such. This small volume was the winner of the 2005 Pulitzer Prize for Poetry and that alone intimidated me. As I began to read, I was immediately drawn in by Mr. Kooser’s thoughtful words. I found myself transported to my youth as I read A Jar of Buttons; Turkey Vultures made me smile as I recalled pointing out one from our patio to a friend just last week; and At the Cancer Clinic brought thoughts and prayers for those who are winning—and those who have lost—their battles with the disease. 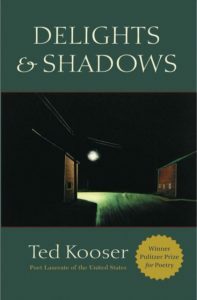 For those of you with an appreciation for poetry, “Delights & Shadows” may already have a place in your library but, should you not yet have formed a full opinion, consider this an invitation to give it a try. For more on Rebekah Bachman and her love of books, visit the Contributors tab.